EA have released a new 1.22 Patch for BF2, the incremental 1.21 to 1.22 version of which weighs in at 9.3MB. The changes in this patch are listed here, and it is mainly gameplay/bug fixes. I would recommend all BF2 players update to this patch as soon as possible. Meanwhile EA is still working on their major 1.3 Patch. A new final version of the 1.1 Patch for Quake 4 has been released. It's around 120MB in size and contains a range of fixes, multiplayer improvements, dual core/HT optimizations and some new maps - changes are listed here. I would recommend all Quake 4 players update to this version, as it no longer appears to be a beta patch. Update: This patch has been officially withdrawn, as there are problems with the widescreen functionality. A new one will be released soon, but for the moment if you have it installed do not enable the widescreen function, or disable it if you have it enabled as it can damage your monitor. As everyone is desparate for information about optimizing Elder Scrolls IV: Oblivion, I thought I'd let you know how my upcoming Oblivion Tweak Guide is going. Good news: there is absolutely no shortage of things to tweak in Oblivion. Bad news: there are so many variables and so much information (and misinformation) flying around, that I am taking a while to test and document - where necessary with screenshot comparisons - all the useful settings and tweaks. This game is one of the most complex and entertaining that I've ever seen, so I want to do it justice with my guide. Note that people have discovered bugs and glitches in various quests in the game - inevitable really given Oblivion's complexity - so I urge you to make backups of your earlier saved games (found under your \Documents and Settings\[User]\My Documents\My Games\Oblivion\Saves\ directory), because once the first patch comes out for Oblivion, you may find you will have to reattempt certain quests to complete them properly. In any case take the time to go through our Oblivion Technical Issues thread for a range of working tweaks, console commands and advice, and stay tuned as I try to release the Oblivion Tweak Guide as soon as possible. And please be wary of using a lot of different tweaks and other peoples' .ini files as by some accounts these can cause unintended visual and gameplay glitches and crashes. Back up all relevant files first, and be conservative in the tweaks you apply. Neowin have posted details and screenshots of the New Google Search Results Page. It basically tries to pack more info into the page. Google is famous for its minimalist UI, I'm not sure why they would consider gambling with this. Extremetech take a look at Gaming in Vista. A key thing I noted from the article is that it is unlikely that DirectX10 will be backward compatible with Windows XP, and as such this effectively means that with Vista delayed to January 2007, DirectX10 is similarly delayed. If you've been putting off upgrading a graphics card because you were waiting for DX10, I'd suggest that if you have a particular game in mind that you want to enjoy now (e.g. Oblivion), you should consider upgrading your hardware now. Yes, another chapter in the ongoing problems here at TweakGuides.com - even though my new host is far more stable, far more robust, and certainly not a cheap solution, the site keeps becoming inaccessible after a period of time. We're working to resolve the issue, it may be related to the massive amount of traffic we're getting for the Oblivion-related material, but I suspect it's something else. Once again, apologies. Update: Turns out it was a simple Max Clients setting that was insufficient. It's been upped and things seem to be OK now. Aside from this issue, the server is handling the site load quite well. The game that's on everyone's lips at the moment is taking up a lot of my time right now as I am about halfway through writing the Oblivion Tweak Guide. Things are going to be very busy for me this week, so I'll do my best to get the guide out soon, but please be patient. For the moment, I have just posted the full list of Oblivion Console Commands, which you might be interested in seeing. You can also download it in a text file here. If you see this, you're officially on the new server. The forums will be open, and I am trying to make sure everything works 100%, but there will be some initial teething problems as I try to set everthing up optimally on this new server, provided to us generously by EuroVPS. Update: Well we just had our first major glitch - a long outage. It was apparently triggered when I ran an automated backup of the site, causing some sort of software failure. I really do apologize for these constant outages and disturbances, they're becoming an embarrassment but I will persist in getting the site rock-solid as soon as possible. On the plus side I put in a fair bit of work on the Oblivion Tweak Guide while the site was down. It's time for TweakGuides to pack up and move to a new server. I have to do this now, so that when my Oblivion Tweak Guide comes out shortly, we will be established on a faster, more stable environment. So what does the move mean for you? Well the main site should remain up throughout the whole deal. However the most noticeable impact is that I have to shut down the forums temporarily. Apologies for the inconvenience to forum users, particularly at such a busy time. The reason for the forum downtime is that even though I have shifted the whole site across to the new server, it takes the servers around the world time to update the fact that the text address 'www.tweakguides.com' points to a new IP number. This updating of the Nameservers can take up to 48 hours for some people. So while I can keep two copies of the main site running, I can't keep two copies of the forums running because some people will be posting in the old one and some on the new one, causing a real mess. I recommend you keep checking the site at its usual address, and when you see the forums are open, and a message on the front page saying you're on the new server, the move will be all over for you. Update: I have turned the forums back on but made them Read Only for everyone. That way people who want to read about Oblivion tweaks for example still can. Even if you find a way to modify data on the forums, I strongly urge you not to as all changes will be lost. Ok, I've managed to pull myself away from Oblivion and I can give you some brief information on what's going to happen on the site. Firstly, I am well underway in understanding Oblivion's engine and documenting the working tips, tweaks and setting descriptions. It's a lot to get through, but thankfully all across the planet right now a lot of people are experimenting with Oblivion and posting their results, so I have a lot of valuable information to work with for compiling the guide as fast as possible. Sadly however, having just installed and played The Godfather for a little bit, I've found it has absolutely no tweaking potential whatsoever from what I can see. I've checked the .ini file, Registry entires and various other bits and pieces and the game is a straight made-for-console PC port. My thoughts and some screenshots are here. So as such, unless someone can tell me otherwise, there's nothing I can write a Godfather Tweak Guide on. Also, sometime during this hectic period I will have to shut down the forums for a little while as I move the entire site to a new server. I will try to pick a reasonable time to do this over the next few days, and give you clear warning of it. Boy oh boy, when it rains it pours doesn't it folks? If you need a Word-based wordprocessor anytime, anywhere there is web access, then you should try AjaxWrite. Nothing to download or install, it simply opens up an Ajax-based window which looks exactly like Word, and has much the same basic functionality. And of course you can open, edit and save documents to your hard drive just as you could if you were running Word itself. Very handy, and it's totally free of course. It's not often I can say with such confidence that PC gaming has taken a new step forward, but today is one of those days. Yes, the much-anticipated, some would say overhyped, Elder Scrolls IV: Oblivion was finally installed on my system tonight, and I began to play one of the most well-crafted games I have ever laid eyes and ears on. All I can say is believe the hype! Even though I am not a big RPG fan, this game is such a great combination of FPS, RPG and adventure gaming that it should satisfy almost anyone. If you're interested, check out my Screenshots of the game at 1280x1024 with everything at maximum, and read my thoughts on Performance and Tweaks. In the days that follow, I will document the settings and tweaks for this game in detail, culminating in an Oblivion Tweak Guide to hopefully do the game proud. Update: More tips and tweaks I've tried here. Nvidia have released a new Beta 84.25 Forceware which has listed as its only new change over the previous 84.21 official drivers 'General Compatibility Fixes'. Now I would suggest that this driver is highly likely to contain either optimizations and/or bug fixes relevant to Elder Scrolls: Oblivion, so if you are currently playing that game, give these a go. If necessary use the Nvidia Forceware Tweak Guide to do a full cleanout of any other graphics drivers first before installing these to ensure you have the best chance of being trouble-free. Don't forget to defrag after installing too for smoother FPS. Microsoft have officially confirmed that although Windows Vista will be released to PC makers in November 2006, that it won't be available to the average consumer until January 2007. This delay gives the PC makers a chance to prepare for their release of products with Vista. However it's not all bad news, apparently Microsoft will use the time to further improve Vista, and hopefully shortly after it's released there will be an SP1 to really firm the OS up. This Article outlines even more problems with the latest version of StarForce discovered by people on the Futuremark forums. Apparently the latest version runs in the background regardless of whether you're playing the protected game, and can cause sudden reboots when trying to copy discs. I'm not a big fan of StarForce, and while the story may be true, I urge people not to suddenly believe everything that is wrong with their PC is due to StarForce. The vast majority of the time, if your system is crashing or rebooting it is due simply to excessive heat or sub-optimal settings, not StarForce. On the other hand I also recommend that users check out this post for more details of checking to see if you have StarForce installed on your system. Well, Elder Scrolls: Oblivion is officially released today, and those who have their hands on the game are giving it excellent reviews. We already have two new dedicated threads on our forums with interesting new movies/screenshots/discussions about the game: Oblivion Technical Discussions and Oblivion Gameplay Discussions. Once I get my copy of the game in the next day or so, I will commence writing the Oblivion Tweak Guide for completion as soon as possible - stay tuned! Note also that the Elder Scrolls Construction Set for creating Oblivion mods has just been released; more details here. Now for the bad news. As many of you would know we've been experiencing site instability and lack of responsiveness. I am not satisfied with this at all, and so I will be moving the site shortly to a more reputable and better performing host. This unfortunately means that the forums may be out of action for up to a day or two for many people as DNS changes take effect, but for the most part there should be no interruption to the main site. It's a big pain I know, but a necessary one if I want to keep this site growing without slowdowns and interruptions. I will try to sort this out as soon as possible, my main concern is to make sure the site is prepared for the major load which will occur when I release the Oblivion Tweak Guide. Microsoft have released a new build of the Internet Explorer 7 Beta 2. If you're using IE7 Beta 2, I suggest you uninstall it and install this latest version. More details can be found here. It mainly has bug fixes, and unfortunately still does not address such (minor) issues such as being able to fully customize the toolbar button locations. Although not yet officially released, the Firefox 2.0 Alpha 1 is available. This is an alpha, which is basically a very risky piece of software, so you might want to consider using this Portable Version of the Alpha 1 which carries less risk of ruining your existing Firefox profiles. Many extensions will not work with this Alpha, so you can try using these Nightly Tester Tools if you want to force them to work. Finally, I'm not sure of all the changes this Alpha brings with it, but I really don't suggest you try it unless you are adventurous. To my utter frustration TweakGuides was unreachable again for over two hours recently - this time not because of my host Dehe.com, but their underlying network provider GNAX. So not only did my site go down, but a whole range of servers with other hosts dependant on this major network provider were out too. Details are here, and to be honest I'm getting very tired of the hosting industry as a whole. Short of setting up a server in my own home, there's nothing I can do about this. However I am hoping that this will be the last glitch this site experiences for a while, especially with Oblivion due out shortly. If you're interested in trying out Beta 2 of Windows Vista or Office 2007, you can Sign Up with Microsoft to obtain these betas as soon as they are released to the public. I've gone through and done a thorough refresh of the Nvidia Forceware Tweak Guide. For the most part the changes are minor, however the Advanced Tweaking section (Pages 9 & 10) has been overhauled both to remove a great deal of outdated information, and also be much easier to use, plus I've added DXTweaker to the tweaking utilities. If you haven't used the guide in a while, give it a run-through to make sure your Nvidia graphics card is using the best possible settings. After feedback on the forums about the best designs to use, I've now released a range of quality TweakGuides branded merchandise so that people can publicly show their support for the site, yet not look totally uncool while doing it. This also gives TweakGuides supporters a means of contributing to the site, while at the same time getting something in return. I have personally inspected several items from the range, and I can vouch for the speed of delivery, the excellent packaging used and the quality of the products themselves. You can read all about it on the new TweakGuides Merchandise page. Nvidia have released the official Forceware 84.21 graphics drivers. These drivers contain a range of performance improvements, bug fixes, and support recently released Nvidia graphics cards such as the 7900 series - for a full list of changes see here. I recommend that all Nvidia users upgrade to these drivers. Note that there are no major changes between the official 84.21 and the previous 84.20 beta drivers, but there are improvements between this version and all other versions including the 84.12 betas. Note: I will do a major review of my Nvidia Forceware Tweak Guide shortly as it is starting to become out of date in specific areas - especially the Advanced Tweaking section. I will do a similar revamp of my ATI Catalyst Tweak Guide in a little while, hopefully with assistance from ATI. Whenever you enable Video Synchronization (VSync) in a game, you will get better image quality due to the removal of "tearing": that is, when the top and bottom halves of the image go out of alignment, especially during fast turning motions for example. However if you enable VSync your average Frames Per Second (FPS) also drops because of the way your graphics card waits for data to be synchronized before displaying it on your monitor. The only way to enable VSync and be rid of tearing, yet at the same time not have to worry about reduced framerates is to enable an option called 'Triple Buffering'. However to further complicate things, this option is often not available in many games, and if enabled in the graphics card control panel only works for OpenGL games, not for Direct3D games. Along comes DXTweaker, a utility which can force Triple Buffering in Direct3D games. However, some very important things to note: firstly, PunkBuster may detect DXTweaker as a hack, so be careful when using it for online games. Secondly, Triple Buffering has the drawback that it uses more video memory to store graphics information, and thus for graphics cards with less video RAM and/or in games which are more graphically intensive, forcing Triple Buffering on will result in laggier mouse movements and increased texture loading pauses. So basically for fastest performance in games, disable VSync and disable Triple Buffering. However if you believe the tearing is just too annoying, enable VSync then check to see if the in-game options allow for Triple Buffering. If so, enable it - or use DXTweaker if it's an offline game - and see if it improves performance without generating too much lag and stuttering. The latest Battlefield 2 "booster pack" has been released: Euro Force can only be purchased online from EA Downloader. This pack adds new weapons, new vehicles and new maps. On the plus side, this 370MB download is fairly cheaply priced at around $10.00US. On the negative side, I find it annoying that EA has decided to focus on releasing (non-free) expansion packs, but has delayed patch releases and gameplay fixes for so long. In any case the Battlefield 2 Tweak Guide will not require any updating for this pack, as it only adds new gameplay content and does not change the game engine. An Official MS Blog has revelead that the release date for Vista is likely to be November 2006. The date seems to have been removed now from that entry, but I'd say that sounds like a reasonable release date. The blog also provides a good MS link for examining Vista's Features in better detail. Microsoft have released some more patches on Windows Update. Most people should simply see the latest version of the Windows Malicious Software Removal Tool, but there is also a separate Security Update which has been released today and doesn't appear in my Windows Update. Most of you will know about Google Earth, the virtual mapping of the entire planet in detail. Well now you can view the red planet in similar style by going to Google Mars. Note that to change it from the psychadelic-looking colors to something more normal, click the Visible or Infrared buttons at the top right. This is one of the most detailed scientific map of Mars available. It isn't available in full 3D yet like Google Earth, but you can view a 3D Movie (56MB/122MB) using the map data. In much the same vein, you should also check out Google Moon. Valve have released a significant update to the Steam client as well as the Source engine. To download it simply restart your Steam client while online. You can read the details here. Aside from a few new features and fixes, the most important update is the 'Improved filesystem throughput' Source engine fix which apparently helps address the stuttering in Half Life 2. I haven't tried this myself as yet, but you can report your results in this thread on our forums if it works to reduce/remove stuttering for you. As you may have noticed, the site has been down again for most of today. My host has been trying to move the site to improved hardware to prevent this happening again, but repair of data corruption and replacement of a RAID controller on the server resulted in this major downtime prior to the move. No data has been lost, and once again my apologies for this annoyance. Hopefully in the next day or two things will become completely stable - if not I will change hosts - and by the end of the month as I prepare to write my Oblivion and Godfather Tweak Guides, the site will be rock solid again. Update: The site has been running superbly over the past 24 hours, and is now more responsive than it's ever been. Fingers crossed it will remain this way, but all indications are that it will. You may have heard about StarForce; it's a form of copy protection software which secretly hides itself on your machine when you install games which use it, and stays there even after you uninstall the game. It is an unnecessary, nasty piece of work, rumored to be the potential cause of CD/DVD drive failures and system crashes. We've discussed it in this thread on our forums. Well apparently a new game called Galactic Civilizations 2 has broken with tradition and does not use any copy protection software. It's a bold move I admit, given that most people pirate anything which isn't nailed down. However it has turned out to be more commercially successful than first thought. So, seeing potential damage to their business, and in an effort to illustrate precisely why they are fast becoming the most disliked feature of the digital era, StarForce have decided to provide a working link to the warez version of Galactic Civilizations 2 on their forums. They do this supposedly to prove their somewhat obvious point that the game is being pirated - much the same way as if one person were to shoot another person during a debate on gun crime to prove their point. The upshot of it is that they have illegally promoted further piracy of the game. This has rightly confused the makers of Galactic Civilizations 2: the last place you'd expect to promote the piracy of your game would be that ever-so-staunch supporter of digital rights, StarForce. Just goes to show that money conquers morals, and if these are the guys I'm supposed to trust whenever I install StarForce-protected games, then heaven help me if they decide to include spyware or other nasties in their software just to make a buck. We need some way of preventing widespread piracy and encouraging game companies to produce great games, but believe me, StarForce isn't it by a longshot. Update: here is the original thread on the StarForce forums where it all began. 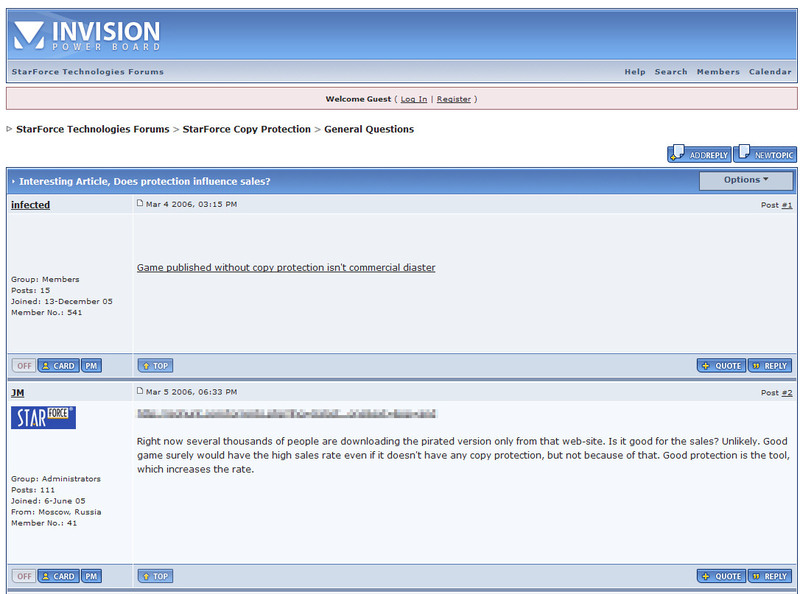 StarForce has removed the warez link and says it was "human error", and that they will will fix up their forum policy. Funny, most forums I know don't allow warez links to begin with, much less one posted by an admin. Fairly obviously this is not an accident. Oh the joys of running a website! Around yesterday afternoon (Australian time), the server on which I host this site decided it would have filesystem problems, and so started to cause data corruption in the Forum database. Fortunately, since the main site is not run off a database, I was able to keep it running through most of this problem. Around 20 hours later my webhost managed to resolve the major issue with the server. The Forums are back up, and I've repaired them so that no data has been lost. I apologize for the inconvenience, and I am pursuing this strongly with my host to make sure there are no more interruptions. In any case I always keep backups of all site data, so we will never have a 'catastrophic' failure on the site. Update: The site is being moved to a better server configuration, where it should run faster and with far less chance of problems. There should be no visible impact to site users of this move. Given the problems resulting from the 1.20 Patch, EA Games have released a 1.21 patch for Battlefield 2. The full version is 367MB, or the incremental patch - for those who are already running BF2 1.20 - weighs in at 13.9MB. You can download this patch from Fileshack or Fileplanet among other places, and details of the changes are here. I have updated the Battlefield 2 Tweak Guide to the latest version, however aside from changes on page 4, not much else has changed. ATI have released the official Catalyst 6.3 graphics drivers. The main changes include a new Avivo video converter, and performance improvements for games like Call of Duty 2 among other things. You can read the full list of changes here. I will update my ATI Catalyst Tweak Guide shortly to reflect the changes. Those of you who saw recently that there will be several editions of Windows Vista may be pleased to know that thanks to the propsed Windows Anytime Upgrade method, should you want to upgrade your Vista edition, you can do so online and without the need to go out and buy another copy of Windows Vista. This is good news, since even I'm not sure which edition I'll end up buying - although it's probably going to be the Ultimate Edition in the end. For those of you who are perhaps too young to remember, there was a film in the mid 80's called The Last Starfighter which featured an arcade game in the movie that supposedly trained you to become an intergalactic pilot. Well apparently a group of fans have remade the game using the original ROM (legally), and it is available to download for free here. It weighs in at around 12MB, and once you download the .zip file and extract the contents, read the READ ME Starfighter.txt file which comes with the game as it is a little tricky to setup and play. You can discuss the game in this thread. Bethesda, the makers of the Elder Scrolls series, have announced the Release Date for the Elder Scrolls: Oblivion First Person Role Playing Game: March 20, 2006. Oblivion is one of the most heavily anticipated games of the last year or two, and if you don't know why, check out these Screenshots for a taste. It has been in development since 2002, and its predecessor Morrowind is widely considered to be one of the most beautiful and advanced first person role playing games ever made. Oblivion will feature even more complex artificial intelligence, a vastly improved graphics engine, voice acting from actors of the caliber of Patrick Stewart (Capt. Jean-Luc Picard from Star Trek), and of course almost limitless quests, non-linear storyline, and the freedom to wander and appreciate the beauty of a vast 3D game world. I cannot recommend a game more highly to you than Oblivion, even if you're not really a big fan of RPG's. As you can see from my enthusiasm, this game will definitely get a Tweak Guide of its own, however unfortunately it arrives at exactly the same time as The Godfather - the other major game for which I was planning to prepare a guide. On top of that I will be extremely busy at my day job during that time. So while I'm looking forward to these games, it will also be a very stressful time for me over those few weeks as I rush to get first the Oblivion, then The Godfather guides out as soon as possible. Oh well, no one said running this site was going to be easy! Microsoft has released a SafeDisc Fix which resolves problems on PCs where a user with a non-Administrator account cannot get certain games to start correctly. For the most part this fix relates to Microsoft games themselves, such as Flight Simulator, but you can give it a try if you are having problems starting certain games. Valve have released a minor update for CS:S on Steam - you can read about the changes here, and as usual simply restart your Steam client while online to download this update. Microsoft has released an update for Internet Explorer 7 which resolves an HTTP authentication issue. Those of you who have installed IE7 Beta Preview should download it from here, or here for the x64 version.